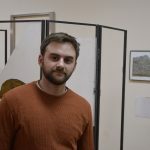 Over the past three years, Phillip Scarpone has pulled bits of inspiration from a variety of spaces — fire escapes on Shipley Street, for example, or the walls of the Wilmington house in which he lives and was raised — and merged aspects of them to create new places or new things. 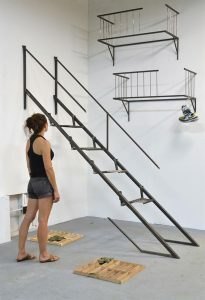 One such installation, “Sky the Color of Cement,” is the size of a small room and comprises hundreds of steel bars and laminated plys of wood, pinned or welded together, all coated with an oxidizing, metal-infused paint. Having grown fond of photography in high school, he has accumulated a lot of reference images of architectural spaces that interest him. 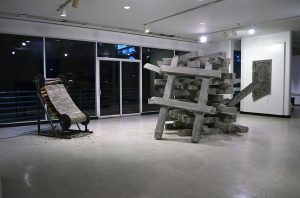 Each of his works ultimately is a merging of various interior and exterior elements into one structure. 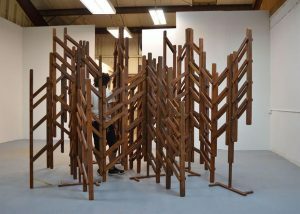 During graduate school at the University of Georgia’s Lamar Dodd School of Art, Scarpone began to shift his focus to the experiential part of architecture — the qualities of moving through a space. (He finds beauty, for example, in the small, angular space beneath a stairwell.) He researched the brutalist architectural movement and grew fond of heavy, concrete forms, which remain strong factors in his work. In the end, any architectural elements he includes in a project will have stemmed from a space in which he has worked, lived, explored and become interested. Environment, not pure architecture, is what matters most to him. Scarpone also works as a fabricator at Amuneal Manufacturing, in Philadelphia. The company builds, among other objects, customized furniture, architectural accents and walls, and store displays for high-end New York City companies. Recently, Scarpone worked on building a staircase for NBC Studios.